I'm into the second week of the Paleo diet, as far as weight goes, I have lost between one and two kilograms, I can't be too exact as my scales are a basic unit and analogue so will need to weigh myself on some decent scales at some stage, preferably hospital scales, they are usually spot on. I wonder if Chemist stores have scales anymore, most of them used to when I was growing up, don't think I've noticed them for a long time now though. After the first week withdrawal symptoms from the carbs, sugar and coffee, the start of this week has been a breeze to handle, though there is a little fatigue still, but considering I have MS, it's pretty normal, the last time though, I was definitely less fatigued so I am hoping the same thing will occur by the end of the month at least, to stay positive you need a few "wins" along the way, so far the weight loss is on track. I think my brain might be coming just that wee bit clearer, I've felt like writing more lately and the words are coming a little easier, but it's too early to know whether it's from the Paleo Diet or just the way MS works, you do have some good days occasionally where you can take on the world, not often, but now and then. I will need to do another grocery order this week at some stage, I am down to the last of my meat, that's a bit scary lol. I even had to buy some Bacon from the Servo/Coles mini mart, I love all bacon, but I am enjoying the streaky bacon a bit more since eating the Paleo way, more yummy fat in the streaky bacon, Coles mini mart only has the usual bacon we seem to prefer in Australia, I like it as well, but Paleo does like more fat to burn! "You don't win friends with salad", though it is a quick and easy supplement to your meat, it's important to eat the veggies/salads, the Paleo diet is not about eating meat only. I think my eyesight might be just a little clearer, in my "looking through fog left eye", that might just be wishful thinking as well, though things like this are what happened last time, a lessening of symptom severity overall! It's like the fog is starting to clear, with holes in the fog that make it a little easier to see through. I'm drinking between one and two litres of water a day. 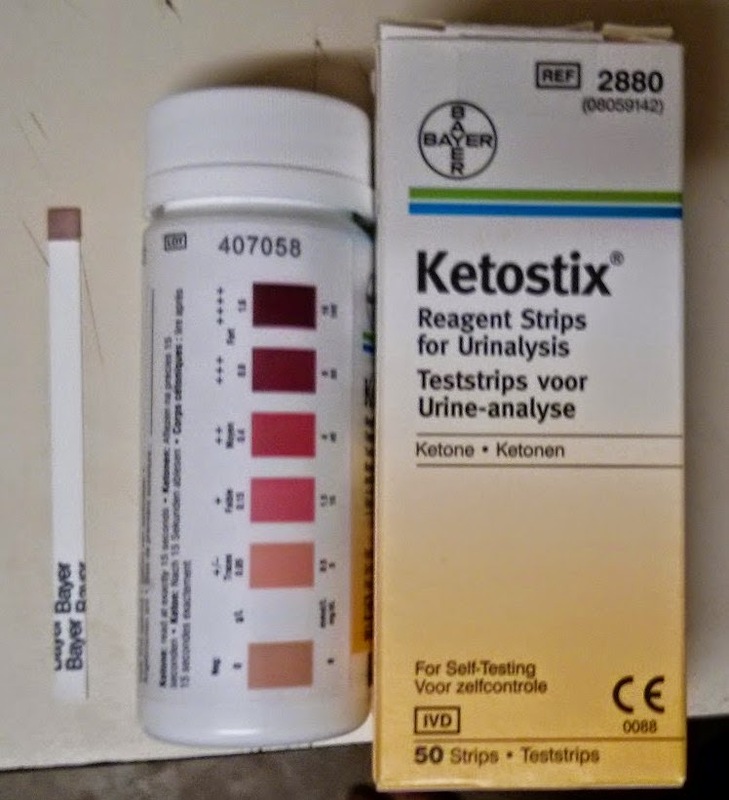 These strips are not needed, though I am going to get some to test my urine to see if I am in ketosis, more of an interest than anything else, I just want to know lol. I tested my urine with the strips and I'm definitely in Ketosis, I've been in "Moyen" (third one from top) going by the scale and colour of the test strip, it's all very interesting! I have also started walking, baby steps (literally), around the block, haven't measured the exact distance, but it is a somewhat hilly sloping block I am on, not sure what's worse, going down the slope or going back up lol. I've lost two Kilograms in weight, I find the best time to weigh myself is the morning, during the day your weight goes up and down like a yoyo, I guess when your drinking litres of water it will tend to add weight as will the food of course, but after a good nights sleep letting the body do it's thing I'm always losing weight after a sleep each day, just a bit but it's happening!